Then it took on steam with Sarah Palin’s declaration that her youngest child (who has Down’s Syndrome) would be put at risk by the President’s plan. The metaphorization of disability is easy to do. 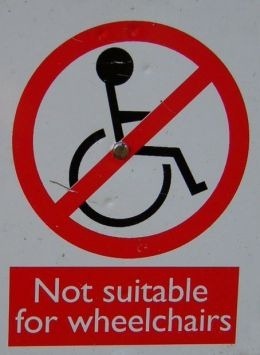 Exemplifying disability as raw victimhood is very easy to do. Of course the difficult thing is to fight for benefits and social programs for our nation’s neediest. The Tea Party (which has many different threads) has one essential signature: it reprises classic American Social Darwinism. Michele Bachmann’s war on veteran’s benefits is a case in point. You see, helping those who have fallen and can’t get up just encourages them to be dependent. Social Darwinism applied to a social context too, of course. It provided a justification for the more exploitative forms of capitalism in which workers were paid sometimes pennies a day for long hours of backbreaking labor. Social Darwinism also justified big business' refusal to acknowledge labor unions and similar organizations, and implied that the rich need not donate money to the poor or less fortunate, since such people were less fit anyway. In its most extreme forms, Social Darwinism has been used to justify eugenics programs aimed at weeding "undesirable" genes from the population; such programs were sometimes accompanied by sterilization laws directed against "unfit" individuals. The American eugenics movement was relatively popular between about 1910-1930, during which 24 states passed sterilization laws and Congress passed a law restricting immigration from certain areas deemed to be unfit. Social Darwinist ideas, though in different forms, were also applied by the Nazi party in Germany to justify their eugenics programs. Of course one of the things that makes the United States the great nation that it is is that you can’t metaphorize people for long. Demagogues can get away with it for brief periods but then Americans say, “But wait, that’s my neighbor and friend they’re talking about!” This is precisely what is happening now. Rep. Bachmann’s steely proposition that wounded warriors can get along just fine without their current levels of support underscores the Spenserian dynamics of what they imagine budget cutting to mean. Bachmann did not propose cutting the corporate welfare that powers the engines of arms manufacturers or ship builders. This is because the issue is not about trimming government spending. It’s about imagining certain human beings as less fit to be served at the table of culture. I recognize that from an academic standpoint these matters are relatively pedestrian. But the big media in the United States has given the TP a free ride on their neo-social Darwinism and that’s got to come to an end. There are real lives in the balance. Genuine people. Heroes. A college student said to me not so long ago that he had no problem with veterans and the like (I think he meant people with disabilities) getting benefits but that guy in the wheelchair on the corner who is begging, well, ahem, he shouldn’t be getting any government handouts. And there it is. Social Darwinism in the age of the Twitter. But it’s still about weeding. About imagine society as an English garden. No real lives need apply.